This week’s noodle dish is heavily inspired by the Italian pasta dish, Cacio e Pepe. 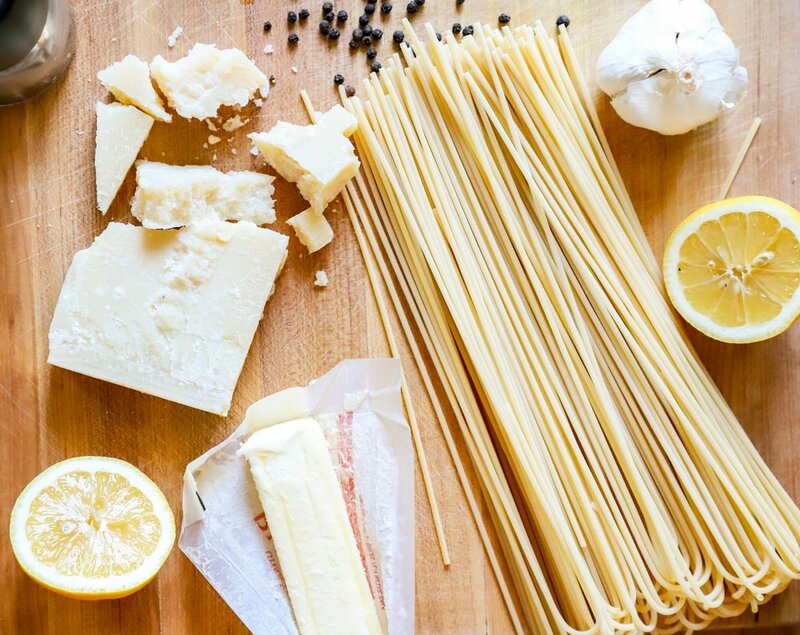 In the world of Italian pastas, Cacio e Pepe is sort of having its moment. It sounds fancy and complicated and intimidating, but it doesn’t need to be any of those things. There are a whole list of potential things that can go wrong—many of which have happened to me while working on this recipe, but this surefire—and not very traditional—method takes the complicated fuss and potential for error out of the equation. The results should be a glossy, creamy, tangy, and downright delicious pasta dish. My weeknight-ready version involves creating a magical lemony Cacio e Pepe butter, which is quickly blitzed together in a food processor. (Quick suggestion: Double the recipe for this magical Cacio e Pepper butter and save it in the fridge for later in the week. It is amazing tossed in some roasted or blanched vegetables—think asparagus or Brussels sprouts or broccoli—for an impressive yet incredibly simple weeknight side dish.) For the pasta, cook the noods just shy of their suggested cook time. Save a little more than a half cup of the starchy cooking liquid shortly before you drain the noodles—some of this will be used to create a glossy sauce to coat the pasta. Moving very quickly, drain the noodles (it is fine if there is water left on the pasta), place them in a large bowl, and finally you will mix in the magical Cacio e Pepe butter and small amount of pasta water until everything is sauce-y and melted and delicious. 1. Bring a large pot of water to a boil. Season very generously with salt—the water should taste very salty. 2. Meanwhile, in a large pan, melt 4 tablespoons of butter over medium-low heat. Add pepper, swirling in the pan until it is nice and fragrant—about 2 minutes. Remove from heat, add lemon juice, and set aside to cool to room temperature. 3. Add garlic and blitz in food processor until blended (*if you don’t have a food processor, follow the directions referenced below). Add in cheese, and process until finely grated. Add in cooled lemon juice and butter-black pepper mixture, and process until it comes together, about 2 minutes. Add this butter-cheese mixture to a large bowl and set aside. 4. Add pasta to boiling water and cook, stirring infrequently, until the pasta is about a minute short of the suggested box instructions, or until noodles are almost tender. Reserve about a cup and half of pasta cooking water. 5. Moving quickly, drain pasta (it is okay if some water remains), and place into the large bowl with the butter-cheese mixture. Toss noodles vigorously to coat noodles. Add in 1/4 cup of pasta water and continue to toss, until pasta is glossy and thickened, adding more pasta water as necessary. Note: you might not need all of the pasta water. Stop when it has come to the right texture. 6. Serve and eat immediately in pre-warmed plates or bowls and top with additional cheese or pepper, as desired. · If you’re looking for a low carb or vegetable friendly alternative, roast some chopped cauliflower with olive oil, and salt at 450 degrees until tender, about 20 minutes minutes. Toss with the magical Cacio e Pepe butter, as you would for noodles. The full recipe for Cacio e Pepe Cauliflower is coming soon. · Bacon! When you add bacon, Cacio e Pepe transforms into Pasta all Gricia, which is just a fancy way of saying “bacon in this is super delicious.” Cook bacon on its own, as you normally would. Chop it finely and add it in at the final step.